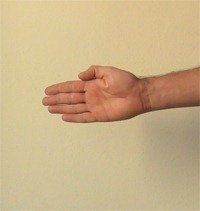 There are two groups of movements in the wrist proper; movements in the plane of the hand (moving the palm or the back of the hand towards the wrist), and marginal movements (movements of the thumb or little finger towards the wrist). 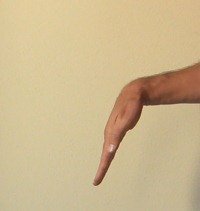 Although not strictly part of the wrist, it is normal to also include movements in the distal radioulnar joint in which the rotary actions of supination and pronation occur. Flexion (palmar flexion, tilting towards the palm) and extension (dorsiflexion, tilting towards the back of the hand). 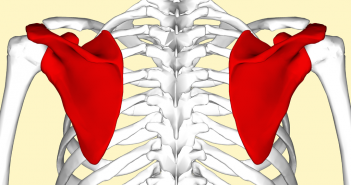 These movements take place through a transverse axis passing through the capitate bone. 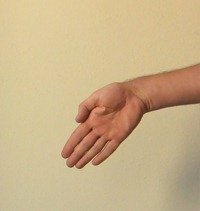 Palmar flexion is the most powerful of these movements because the flexors, especially the finger flexors, are considerably stronger than the extensors. Bending the wrist joint such that the angle between the palm and the forearm is decreased; moving the palm of the hand toward the front of the forearm — see Figure 2. Flexion is more commonly known as “bowing your wrist”. 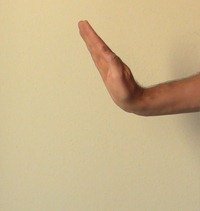 To build strength and stability in this movement, see the Wrist Flexion Exercise. 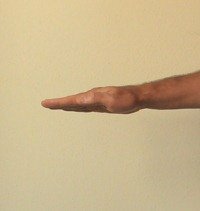 To improve your mobility, see the Wrist Stretch Exercise. Straightening the wrist joint such that the angle between the palm and the forearm is increased; moving the back of the hand toward the back of the forearm — see Figure 3. Extension is more commonly known as “cupping your wrist”. To build strength and stability in this movement, see the Wrist Extension Exercise. 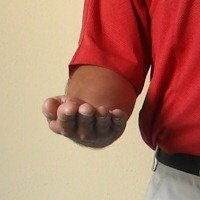 To improve your mobility, see the Wrist Stretch Exercise. Abduction (radial deviation, movement towards the thumb) and adduction (ulnar deviation, movement towards the little finger). These movements take place about a dorsopalmar axis (back to front) at the radiocarpal and midcarpal joints passing through the capitate bone. Medial movement toward the midline of the body; moving the little finger side of the hand toward the medial side of the forearm — see Figure 5. Adduction is sometimes referred to as “uncocking” or “down-cocking” your wrist. To build strength and stability in this movement, see the Wrist Adduction Exercise. 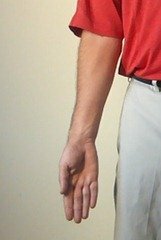 Lateral movement away from the midline of the body; moving the thumb side of the hand toward the lateral side of the forearm — see Figure 6. Abduction is more commonly known as “cocking your wrist”. To build strength and stability in this movement, see the Wrist Abduction Exercise. Supination and pronation are positions of either the forearm or the foot. When the arms are unbent and at the sides, the forearm is in supination when the palm faces to the front (anteriorly), without an associated movement of the upper arm at the shoulder (Figure 8), or when the forearm is flexed and the palm faces up (Figure 5). Pronation is the opposite of supination. 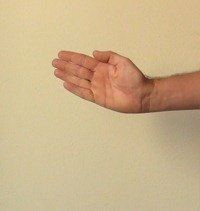 When the arms are unbent and at the sides, pronation will move the palm of the hand to a posterior (rear) facing position, again without an associated movement of the upper arm at the shoulder (Figure 9). When the forearm is flexed the palm faces down (Figure 6). Supination and pronation of the forearm should not be confused with external (lateral) rotation and internal (medial) rotation of the humerus at the shoulder, respectively. 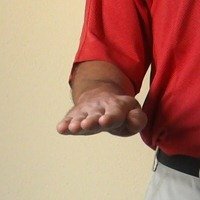 To build strength and stability in this movement, see the Wrist Pronation and Supination Exercise and Wrist Pronation and Supination (Reverse Grip) Exercise. When standing in the anatomical position, internal or external rotation of the humerus at the shoulder can perform part of the rotation of the hand — see Figures 6, 7 and 8 — this upper arm (humerus) rotation occurs at the shoulder and does not constitute supination or pronation of the forearm, which occur at the radioulnar joint. 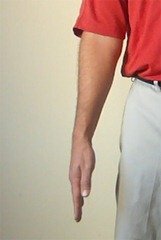 To isolate external rotation at the shoulder from supination of the forearm, or internal rotation in the shoulder from pronation of the forearm, you can stand with your elbow down by your side, with the elbow flexed to 90 degrees so that the forearm points directly in front of your body, with the palm of your hand facing inwards — see Figure 4. 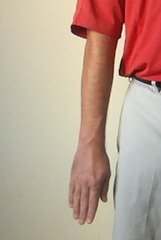 Keeping your elbow by your side, the act of moving your forearm so that the palm is facing upwards is supination of the forearm (Figure 5), and downwards is pronation (Figure 6). 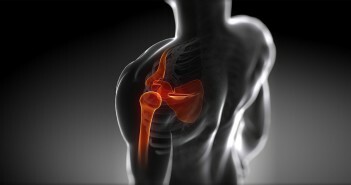 To improve the internal and external rotation mobility in your shoulder, see the Shoulder Internal Rotation (Side Lying) Exercise and Shoulder External Rotation Exercise, respectively. To improve external rotation strength and stability in your shoulder, see the Sidestepping Shoulder External Rotation (Band) Exercise and the Shoulder External Rotation (Band) Exercise. Golf Swing 504. 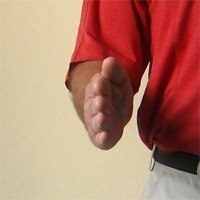 Downswing: How to Release the Golf Club.